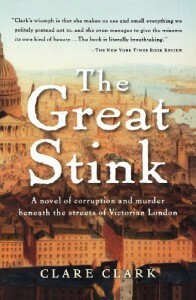 Like her other novel, [book:The Nature of Monsters], Clare Clark accomplishes two things with The Great Stink. One, is a powerful (and queasily wonderful) evocation of the sights, sounds and smells of a by-gone London. In this case, the city of the Victorian Age c. 1860. The greatest city in the world is drowning in its own filth, and Parliament has reluctantly begun funding an enormous public works project that will modernize the capital's sewers. Say what you like about Clark's other qualities as a writer but even her harshest critics must admit to a marvelous facility for describing urban life that is vivid and economical - using just the correct amount of adjective and simile to create 19th century London (at least the London that existed for most of its inhabitants - unhealthy, foul, and full of men and women brutalized almost beyond humanity by the misery of their lives). Like St. Paul's in Monsters, the London sewer is a major character in the novel, dominating the lives of both protagonists. The second thing Clark accomplishes is another engrossing tale about people growing into their humanity and becoming better for it. The novel follows two men - William May and Long Arm Tom - whose destinies don't cross until the very end of the book, and, even then, they never actually meet. William is a veteran of the Crimean War (1854-56) who returns suffering from what we would recognize as post-traumatic stress disorder. In 1860s London, a veteran doesn't even have a dysfunctional VA to fall back on for support - he's utterly alone and, if he exhibits any abnormal behavior, he is despised, called a coward, and could be sent to an asylum. William finds solace from his demons in the sewers and by cutting himself. He's fortunate in getting a job as one of the engineers on the great project to rebuild London's sewers. There, the orderliness and routine help focus his mind; the dark and filth of the sewers mirrors the "dark and filth" in his mind, and the cutting releases that internal filth into the tunnels under the city. As the months pass, William eventually finds his way back to a semblance of normality. The imperative need to cut becomes less and less, and William actually hopes to lead a normal life with his wife, Polly, and newborn son, Di. Unfortunately, just when he's reached this plateau, William becomes innocently caught up in a kickback scheme involving a Mr. Hawke, member of the board overseeing the project, and Mr. England, a maker of cheap brick who had hoped to secure a lucrative contract. The circumstances of Mr. England's subsequent murder drive William insane - he suffers a complete breakdown - and he's confined to an asylum, a fate worse than death in those days. Meanwhile, Hawke has framed him for the murder and he faces the gallows. Long Arm Tom, our second hero, is an older man, a tosher. He lives, like too many others, on the fringes of "decent" society, descending into the sewers to scavenge for the detritus of the better off to sell or to capture the rats sold to enterprising touts for use in the dog fights recently declared unlawful. Though illegal, Victorian "gentlemen" and the uncouth laborers of the city alike relish the spectacle of dogs competing with each other to kill as many rats in a certain time as possible. It's at one of these bouts that Tom runs into Lady - a mangy, disagreeable looking mutt who rests her head on his foot before being dragged off by her abusive master. Later that night, Tom discovers her following him home, her rope leash frayed and broken. Compelled by a need he doesn't understand, Tom lets her come home with him. Lady comes to fill the void in his life where he needs someone to love. Soon they become inseparable companions and he discovers that she's a natural ratter - a veritable rat-killing machine. This "talent" leads Tom to enter her into the dog fights, where she captures the attention of the Captain, who is actually the Mr. Hawke who bedevils William's life. Hawke/Captain offers Tom a substantial sum for Lady, enough for him to live relatively well for the rest of his life, and he accepts, though he suffers inexplicable fear and anxiety at the prospect of losing her. The Captain, however, cheats Tom on the deal. Tom vows to get Lady back whatever the cost. Now, the Captain had hired Tom to help hide a murdered man in the sewers. This man, Mr. England, had carried papers that Tom takes and hides, the paranoia and suspicion natural to his life telling him he needed some insurance in case the Captain tried to "shop him to the peelers" (the police). Here is where the lives of William and Tom collide when, in the course of defending him, William's lawyer encounters Tom and learns of the potentially damning evidence. To go further would spoil the novel even more than I may have already done, so anyone at all interested in the story should pick up the book. As with Monsters, Clark's tale plots the development of a person's humanity. In the case of William, a person who's lost his and must find a way to regain it or go mad. In the case of Tom, a person who knows there's a void in his life but doesn't know what it is or how to fill it. I really, really like Clare Clark and look forward to her next novel. While I won't begrudge her the right to stay within London's city limits, it would be interesting to see if she can widen her horizons and write as compellingly in a different setting.